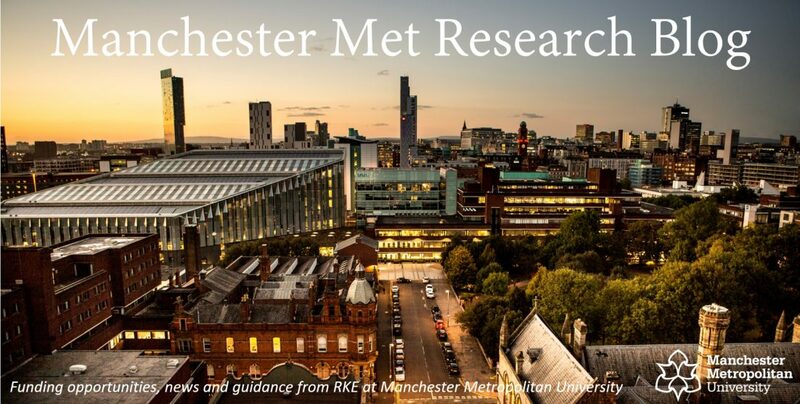 The demand management measures implemented by the Natural Environment Research Council (NERC) mean that there are restrictions on the number of research applications that Manchester Metropolitan University is permitted to submit to each Standard Grant round. This can include applications that are externally led. In order to manage the process, researchers who wish to develop an application for the next NERC Standard Grant round (deadline of 16 January 2018) are required to submit an Expression of Interest (EOI) by 17:00 on Monday 02 October using the form available here. The EOI form includes guidance notes about demand management and the internal selection process. To return the completed EOI form – or if you have any questions about a possible NERC application – please email Justin Smith justin.smith@mmu.ac.uk. The NIHR Public Health Reseach Programme has announced the next round of commissioned calls. The PHR Programme funds research to generate evidence to inform the delivery of non-NHS interventions intended to improve the health of the public and reduce inequalities in health. The scope is multi-disciplinary and broad, covering a wide range of interventions that improve public health. Please contact the RKE office if you are interested in applying for NIHR funding. Since the referendum MMU has submitted 61 bids to EU funding schemes with over 300 European organisations. Our academics and colleagues find working with international partners exciting, rewarding and at the heart of much good research. MMU’s success rate has seen no change since the referendum and we’ve had some exciting successes over the last few months. We’re in contact with colleagues at other UK institutions who are saying the same thing. We’re also working with Universities UK International (UUKi), the UK Research Office in Brussels (UKRO), the British Council and anyone else who will listen to make sure the sector’s voice is heard during the negotiations through reports such as UUKi’s priorities post-exit and the #weareinternational twitter campaign. The Prime Minister included research in her recent speech in Florence as well as her earlier Lancaster House speech as a key issue for the negotiations. And last month the UK government issued a Future Partnership Paper on Science & Innovation Collaboration emphasising research as part of any future relationship with the EU. Higher Education is on the Brexit agenda and seen as part of the “offer” the UK is making for its future relationship with the EU. The UK government is also emphasising its global research links: it recently announced new international fellowships with the Rutherford Fund. The money for its Global Research Challenges is ramping up and look at the recent posts on this blog for international (largely non-EU) research funding from the British Academy, AHRC, ESRC, Newton Fund, HERA etc. Elsewhere, the British Council’s 2017-20 Corporate Plan emphasises global mobility – and there’s talk of a worldwide scheme to replicate elements of Erasmus+ beyond the EU. The funding landscape will look different but indications are that it will (continue to) be globally focussed. It’s worth restating this one, though: Because the UK has formally announced that the country is leaving the EU, then the nature of its relationship with the union will change. There are various models out there – at the moment we don’t know which one we will end up with and it’s beyond the wisdom of this blog to make any predictions. But, also, it’s worth remembering that NO-ONE knows – a lot of the so-called facts the media report are actually political posturing and people trying to sound wise. In her Florence speech, the Prime Minister emphasised a desire for a transition deal lasting to the end of the current EU budget (2021) so changes are likely to be minimal at first. And if the UK is committed to fulfilling its financial commitments for two years post-Brexit, then it is more likely we will remain part of research funding schemes until that date, too. The European Commission has been reviewing both Horizon 2020 and Erasmus+ ahead of revised research and mobility programmes expected by 1 January 2021. Manchester Met has contributed to these and we’re hearing that these schemes will look to make further links between EU Higher Education and institutions outside the union to help tackle global issues and priorities. That said, we’re not expecting massive changes to the funding but given the timing of the reviews, it’s hard to believe the UK’s future involvement with the scheme is not also being discussed. The UK remains eligible for European funding. The UK Treasury has issued a note to say that they will underwrite successful projects, even if they continue beyond our exit from the EU. It’s not quite clear on when this underwrite covers until but we’re confident it covers projects for AT LEAST the next year. This is all tied in with the nature of both the “exit” deal and the “future relationship” deal – despite the above, the campaigning that the University sector is undertaking and reports in the media, we don’t know what the future EU funding landscape will look like. It’s also worth remembering that just as the UK is working out what its relationship is with the EU will be like post 2019, the EU is discussing what its future as 27 nation states will be like without one of its biggest contributors of finance (and headaches!). The EU could look very different in a few year’s tie and not just because the UK has left. The first phase of the talks are covering the UK’s financial liabilities, the Irish border and rights of EU/UK nationals, and are due to run until at least October. Negotiations MIGHT then turn to the future relationship; trade and the Customs Union will probably take precedence but we know that Research & Science are also seen as important. Therefore, there may not be much news until spring 2019 and nothing certain until late 2019 when a deal (whether transitional or final, it’s unclear) will be put to national Parliaments. FINAL FACT: MMU’s European Funding and Research Development Managers are on hand We’re here to provide advice and support across a range of funders. We’ll update this blog if and when we know more. Categories: Erasmus+, Horizon 2020, News | Permalink. The AHRC have awarded studentships to a number of high-profile non-academic institutions through their Collaborative Doctoral Partnerships scheme. These CDP holders then invite proposals from interested Higher Education Institutions in the summer/autumn of each year. All projects are required to involve a collaboration between a university-based researcher and the staff at one of the CDP consortium institutions. Calls from Historic England and English Heritage and, separately, the Oxford University Museums, are open now (November deadlines) for academics to approach the institution with a potential PhD idea. As the Government starts to set out its vision for our relationship with the EU research community in a post-Brexit world, we turn our attention to the shorter-term and the next phase of Horizon 2020. We are anticipating that the first work programme for Horizon 2020’s last phase (2018-2020) will be launched formally in late October 2017. This is slightly later than previous years as the process has had to feed in the outcomes of mid-term evaluation of the programme along with the report published by the independent Lamy Group (Ed – to give it it’s full title ‘High Level Group on maximising the impact of EU Research & Innovation Programmes’). To coincide with the launch of the new work programme, we will be welcoming our European Adviser Ian Devine to Manchester Met to provide an update on Horizon 2020 and what the future and FP9 might hold. Ian will be in the region between 31 October and 2 November visiting ourselves and the Universities of Manchester and Salford, and will be based here on 31 October (Ed – there will be similar sessions on 1 and 2 November at UoS and UoM and we’re working together to give academics across the three institutions access to the most convenient session for them). Further details will follow, so if you’re interested please hold the date in your diary and keep your eye on the Blog for further announcements . Categories: Events, Horizon 2020 | Tags: Europe, Horizon 2020, Research, UKRO, work programme | Permalink. The British Academy is inviting proposals from researchers based anywhere in the world to develop interdisciplinary research projects which enhance the development of more effective policies and interventions aimed at reducing corruption in developing countries. This programme is supported by the British Academy’s partnership with the UK’s Department for International Development (DFID). The purpose of each project will be to improve the evidence base on what works in tackling corruption; to drive multidisciplinary approaches to developing and disseminating best practice through active stakeholder engagement; and to support international collaboration and the development of research capacity. The geographic focus for the research will be on DFID Tier 1 countries where corruption is a constraint and where a better understanding is needed of what kinds of intervention can make a difference. Countries of specific interest are Bangladesh, Ethiopia, Ghana, Kenya, Malawi, Mozambique, Nepal, Nigeria, Rwanda, Tanzania, Uganda and Zambia, although proposals focusing on any DFID Tier 1 country will also be considered. This call is open to researchers from anywhere in the world. There is no requirement that a UK-based partner be involved in the proposal. The lead applicant must have a minimum of three years postdoctoral (or equivalent) research experience. S/he must hold a position, which is either permanent or lasts at least the duration of the award, at an eligible research or higher education institution, recognised by the British Academy. The programme will fund projects of between £175,000 and £350,000 each, delivering research excellence with practical development impact. Projects must begin on 1 March 2018 and last two years. Applications must be submitted online using the British Academy’s Grant Management System, Flexi-Grant®. The deadline for submissions is Wednesday 15 November 2017 (17.00 UK Time). The purpose of each project will be to develop new ideas and methods to bear on existing international challenges and to deliver policy-relevant outputs which could potentially improve the welfare of people in developing countries. Proposals that creatively tackle cultural, public and/or policy controversies, or explore how such controversies have been understood and responded to in the past, would be particularly welcome. Such controversies might include, but need not be limited to, changing climate, movements across borders, socio-biological problems, artificial intelligence, medical humanities, people and infrastructures, and responses to or understanding of diseases and pathogens. Awards are of one-year in duration, funding for the projects will begin between 1 and 31 January 2018. Up to £50,000. Funding can be used to support research and/or clerical assistance; research expenses and consumables; travel and subsistence; and networking, meeting and conference costs. The purpose of each project will be to bring original interdisciplinary research ideas from the humanities and social sciences to bear on our understanding of the international challenges and opportunities which the UK has faced, is facing and will face. The projects awarded will aim to deliver specific academic, public, cultural and/or policy-relevant outputs. Proposals which relate to the themes of Conflict, Stability & Security; Europe’s Futures; Justice, Rights & Equality; and Urban Futures are particularly welcome. For this scheme originality can arise also from looking at material (such as archival material) in new ways or bringing forth new understanding from material that has previously been unknown or less well known, or innovative combinations of researchers (and/or practitioners) in an interdisciplinary manner.